Relish Culinary Adventures' events are held at a variety of locations in and around Healdsburg. All directions are provided from Highway 101. A phone number for the specific location is provided when available. If you need directions to a private home or have questions, please call Relish at 707.431.9999. 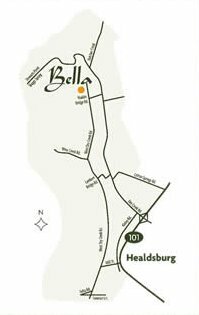 From the South, go north on Highway 101 and take the Central Healdsburg offramp which will put you north on Healdsburg Avenue. At the third stop light, turn left onto Matheson Street (the town plaza will be to the right). From the north, go south on Highway 101 and take the Westside Road offramp. Turn left at the stop sign onto Westside Road and cross under the freeway. Turn left at the stop light onto Healdsburg Avenue (not a hard left onto Vine Street) and go one long block. Turn left again on Matheson Street (the town plaza will be to the right). De La Montanya Winery Going north on Highway 101, exit at Central Healdsburg offramp. Follow Healdsburg Avenue two stop lights and turn left (west) onto Westside Road. From south on Highway 101, exit at Westside Road. Turn right (west) onto Westside Road. Dragonfly Floral Farm Going north on Highway 101, exit at Central Healdsburg offramp. Follow Healdsburg Avenue two stop lights and turn left (west) onto Westside Road. Dry Creek Peach and Produce The farm is located in the Dry Creek Valley of Healdsburg, which is about 75 miles north of San Francisco, in Sonoma County. Getting there is simple. From the San Francisco Bay area. Take Highway 101 north to Healdsburg. 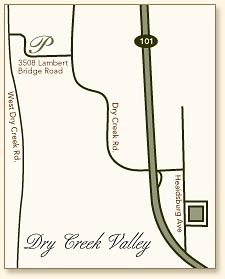 Take the Dry Creek Road exit and turn left onto Dry Creek Road. Stay on Dry Creek Road for approximately 7 miles or until you reach the second stop sign. Turn left onto Yoakim Bridge Road and the farm is about 200 yards on your left. Dry Creek Vineyard From the San Francisco Bay area. Take Highway 101 north to Healdsburg. 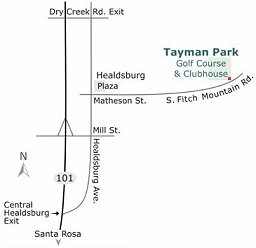 Take the Dry Creek Road exit and turn left onto Dry Creek Road. Stay on Dry Creek Road for approximately 3.1 miles and turn left at the stop sign onto Lambert Bridge Road. The winery will be on your left. Healdsburg Inn on the Plaza	Driving North on Highway 101, take the Central Healdsburg exit. Go straight on Healdsburg Avenue until you reach the town plaza (approx. 1.25 miles.) Turn right onto Matheson Street. Hotel Healdsburg Driving North on Highway 101, take the Central Healdsburg exit. Go straight on Healdsburg Avenue until you reach the town plaza (approx. 1.25 miles.) The hotel is on the left. Turn left (west) on Matheson Street and park in the lot behind the hotel. Middleton Farm Going north on Highway 101, exit at Central Healdsburg offramp. Follow Healdsburg Avenue two stop lights and turn left (west) onto Westside Road. Point Reyes Farmstead/Giacomini Farm From Santa Rosa, take 101 South to Petaluma and exit at Washington Street. Turn right (west) and follow Washington to Petaluma Blvd. Turn left on Petaluma Blvd through downtown and turn Right on “D” Street. On the outskirts of Petaluma, “D” street turns into Point Reyes/Petaluma Rd. Follow this road through the rural area (alongside Nicasio dam), turn right at the 3-way stop sign and go across the purple bridge. From San Francisco, travel through San Francisco to the Golden Gate Bridge. Stay on North 101 and drive through San Rafael to the Lucas Valley Rd. Exit. Turn a left at the light. Continue straight on Lucas Valley Rd.--the road is very curvy. It will take about 20 minutes until you come to a stop sign. At the stop sign, turn right on Nicasio Valley Road toward Nicasio. The road curves to the left around a baseball field and the Rancho Nicasio restaurant and then continues straight. At the next stop sign turn left on Point Reyes/Petaluma Rd. toward Point Reyes. At the three way stop sign, turn right and drive over a purple bridge. Twomey Cellars Going north on Highway 101, exit at Central Healdsburg offramp. Follow Healdsburg Avenue two stop lights and turn left (west) onto Westside Road. Tierra Vegetables Farms Going north on Highway 101, exit at Airport Blvd. (north of Santa Rosa, south of Windsor.) Tierra Vegetables will be on your immediately left. The Vineyard Club Going north on Highway 101, take the Geyserville offramp and turn right at the stop sign. Follow this road into downtown Geyserville and turn right at the stop sign onto Highway 128. Not long after crossing over the Russian River, turn left onto River Road where Highway 128 makes a 90 degree right turn and intersects Moody Road (the Geyserville Oriental Community Center will be ahead of you.) Follow River Road for 3 miles. Don't worry about the "Not a Thru Street" sign--the road continues for several miles. After about 2 miles, you will see a sign at the bottom of a hill that says "Welcome to the Vineyard." Continue as the road becomes curvy up the hill and into the community (the name of the road changes to Vineyard Road). Turn left just past the tennis courts onto Rockmound Road. The clubhouse is the building at the end of this road/driveway. Copyright © 2008 Relish Culinary Adventures. All rights reserved.